I’ve had it up to here with presidential candidates screwing up Denver traffic and commerce this year. Every time one of them comes to town (I’ve lost track of how often it’s been; 5 or 6 times each, I think), major traffic routes through town are shut down for “security” and no doubt to ensure these pampered people don’t have to endure any traffic delays that might interfere with their oh-so-important personal schedules. Never mind that the people of Denver have schedules, too. This is not something that’s good for the city like the national political conventions, where delegates come in and stay for several days, patronizing local restaurants, retail merchants, tourist attractions, etc. Nothing so beneficial as that. When Romney or Obama or their spouses come to Denver, the main route from the air force base to their speaking venue is closed to all other traffic. Depending on where they go and if they stay overnight, routes to and from downtown hotels are closed. 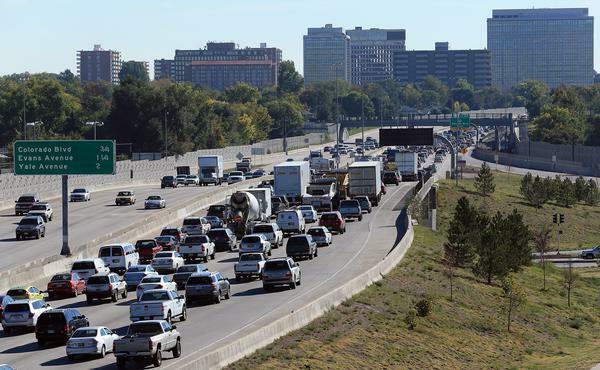 Tomorrow, Wednesday, the day of the presidential debate at Denver University, a 6-mile stretch of I-25, the main north-south route through town, will be closed for 5 hours. All traffic, both local and interstate travelers, will be detoured onto adjoining surface streets. Won’t that be fun? Other local interstates will be closed to overweight and oversized traffic and officials have warned that many Denver school buses may be delayed by the congestion, along with any truck traffic, and it’s been suggested that downtown workers who can work from home should consider doing so tomorrow. The Denver University campus has been closed and tall, heavy wrought-iron-like fencing has been erected around the entire campus. Who reimburses the city for all this disruption? Who pays for all the additional hours our local police put in to provide security, direct traffic, and investigate accidents cause by the disruption? Who reimburses merchants whose customers can’t get to them, or companies whose employees can’t get to work? Who compensates the interstate travelers and truckers who encounter hours-long delays trying to get through town? By the time it’s all over, this will have been a four-day disruption, not just one evening. It started yesterday, when Romney flew in for an afternoon rally. How did I find out where it was? I ran into a detour on my way to a doctor’s appointment; it seems Romney’s rally was about a block away from my doctor’s office. There’s another speech somewhere today, and tomorrow night is the debate. Then Obama is staying over for some event Thursday morning. Everybody I’ve talked to is fed up with these candidates coming to town and creating chaos before hopping on their planes and flying out again without even looking back. I suggest all these presidential debates be held in the same place, probably Washington DC, where they are used to privileged politicos buzzing around town on tight schedules. Spare the rest of us! Next time just point Obama directly south and tell him that there are people in Albuquerque that would love to see him. Like me. We have the dubious distinction of being a battleground state. Otherwise I’m sure we’d be just another piece of flyover country. LOL… Oh yeah, that’s right. We barely have enough people to be called a state let alone a battleground state. You’ve got one more elector than we do. Let ’em fight over yours and leave us alone.